Deluxe Prism Glasses | OhGizmo! I have a theory that breathing the re-circulated air while flying on a plane makes items in the SkyMall catalog seem more useful than they really are. Take these Deluxe Prism Glasses for example. 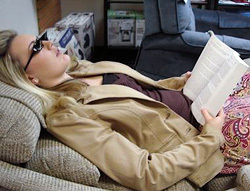 I really have no idea what makes them ‘deluxe’ but they’re designed to fit over your regular glasses and allow you to read a book or watch TV while lying flat on your back. But besides facilitating the super-lazy who can’t even be bothered to sit up the glasses are apparently quite useful for people who’ve had to endure MRI scans. They allow the patients to see out into the room during the scan which makes the whole experience a lot less claustrophobic. The Deluxe Prism Glasses are available from SkyMall for $49.95. I can see them being useful, personally I find reading a book to be very uncomfortable, either my neck is bent or my arms are not resting. Also from an ergonomics point of view they are great, you can be in a relaxed position that your body isn’t damaging itself in. I bought some at http://www.activeforever.com and I use them for watching TV in bed. The TV is at the foot of my bed, so I was constantly straining my neck to see it.